Halloween is so much fun, don’t you think? Bring out the jack-o-lanterns, the ghosts, and the pumpkins! Let’s add a little bit of spooky fun to our learning activities. 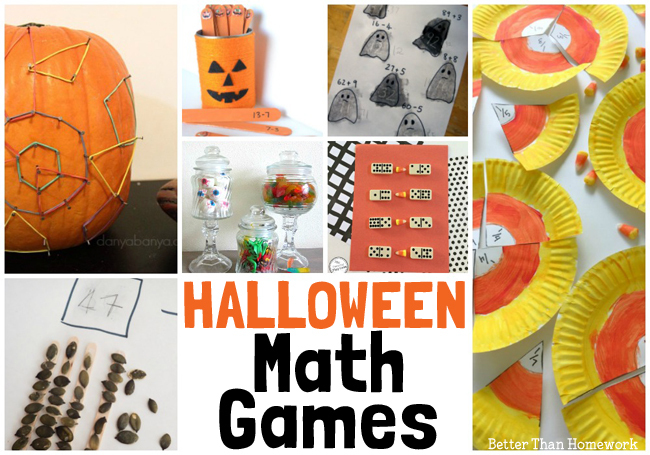 Here are some great Halloween math games that I just know your kids will love. They’re for all levels of elementary school and some can be easily adapted to all levels of kids. 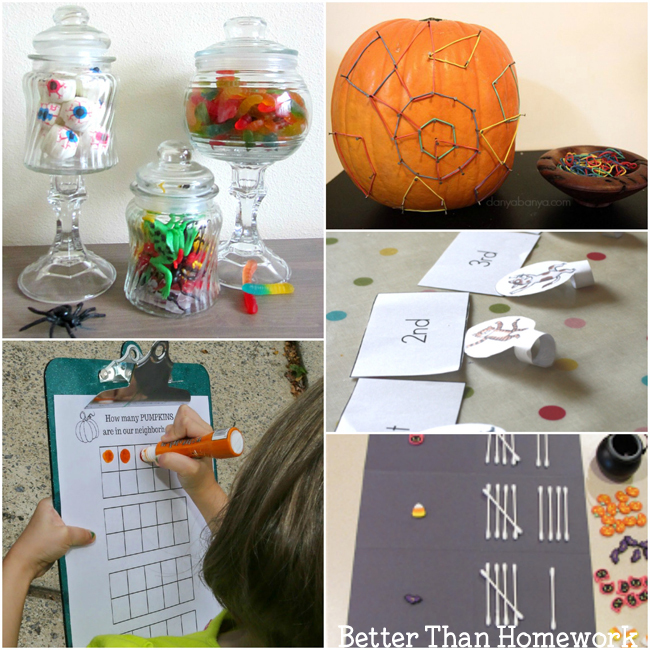 You’ll find that these are great ideas for some extra (and super-fun) math practice at home. Practice estimation with these Spooky Estimation Jars from No Time for Flashcards. This fun activity works on skills for your younger elementary kids, but it can also be adapted as a challenge for your older kids. 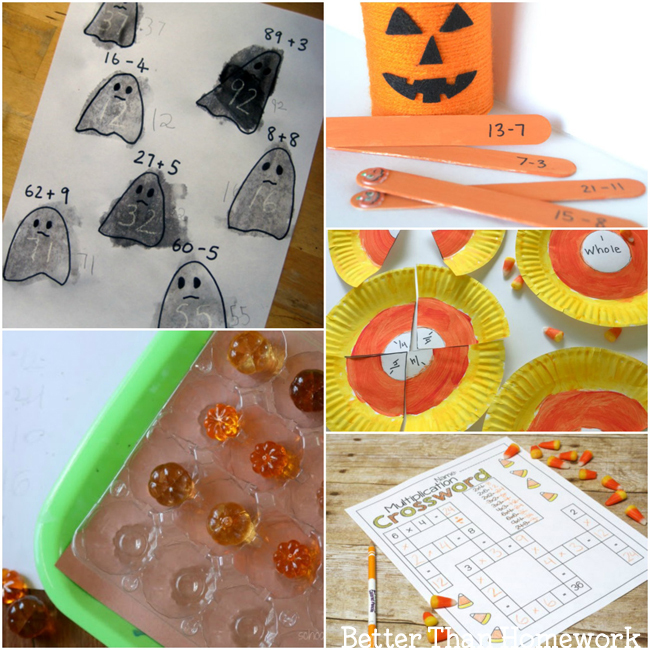 Turn a pumpkin into a geoboard, a classic math tool, for some fun hands on shape practice. It’s great for fine motor skills too! Danya Banya has all the details for this Pumpkin Geoboard. Use the book Room on the Broom for some ordinal number practice (ex: 1st, 2nd, 3rd, etc) with this simple math game from Rainy Day Mum. Go on a pumpkin hunt around your neighborhood and record your results on a ten frame with this outdoor math game from Still Playing School. Use the opportunity to do a little addition practice too. Add a Halloween twist to tally mark practice with some spooky bones tally marks. This is a great hands-on math idea from Miss Giraffe’s Class. Grab a bag of candy corn and use for a little greater than/less than practice. You can find the details for this candy corn math activity at Planning Playtime. 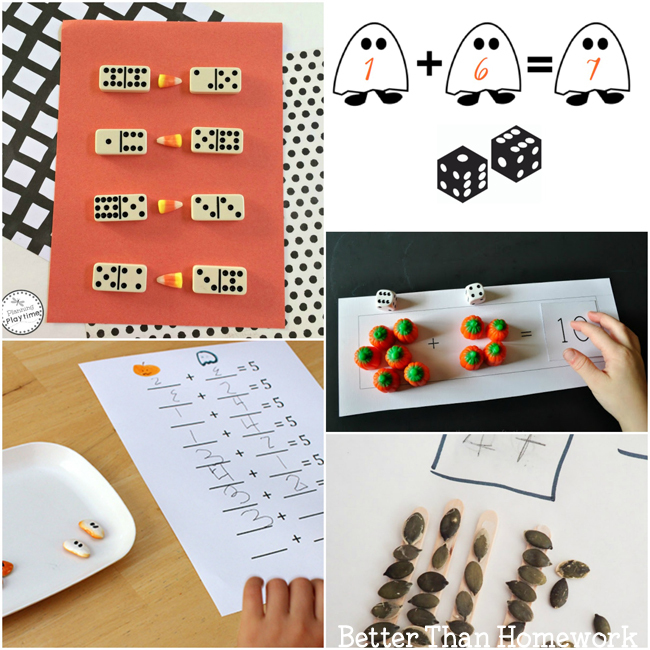 Practice addition or subtraction with this simple printable game, Ghost Roll Math, from Boy Mama Teacher Mama. Roll your numbers, record, and do the math. Use Halloween candies to practice addition with this simple Pumpkin Candy math printable game from I Heart Crafty Things. Add within five and ten with this simple idea from Gift of Curiosity that uses the cutest pumpkin and ghost beans. Create pumpkin seed manipulatives and work on place value and subtraction with this fall math idea from Rainy Day Mum. Do some Spooky Sums from NurtureStore. Since you provide the math problems, this ghost math activity can be suitable for all grades. Make some Halloween Pick-and-Solve Sticks from Creative Family Fun for some fun math fact practice. But, don’t limit yourself to addition facts. You can easily use this method to work on subtraction or multiplication facts. Create and practice fractions with this paper plate Candy Corn Fractions activity from Teach Beside Me. Practice multiplication with a visual Pumpkin Patch Array with this idea from School Time Snippets. You can also practice multiplication with this fun Candy Corn Themed Multiplication Games printable pack from Royal Baloo. I love the multiplication crossword! 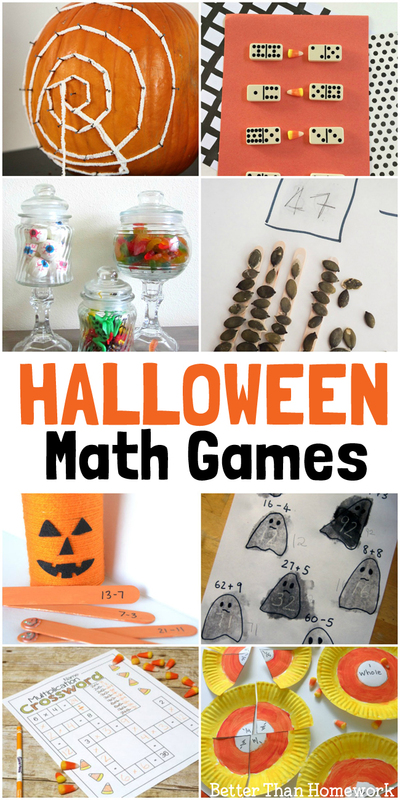 Add some pumpkins and a few ghosts and you’ve got some fun and interesting Halloween math games that are much, much better than homework. Which of these ideas do you think you’ll try with your kids?